1. A ceramic or metal container in which metals or other substances may be melted or subjected to very high temperatures. 2. A place or occasion of severe test or trial. 3. A place or situation in which different elements interact to produce something new. I submit to you that the Fantastic Four movies figuratively adhere to all three definitions, serving as the crucible of the Marvel Cinematic Universe (MCU). All of the dross burns away until something new emerges on the other end. I admit I kind of like the first two Fantastic Four movies from 2005 and 2007. They are utterly horrible, but there’s something oddly charming about their lack of originality. They’re unapologetically silly and bad, and they are not easy to come back from. Most of the people associated with them were burned out by it. It certainly didn’t help the careers of Ioan Gruffudd, Jessica Alba, Michael Chiklis, or Julian McMahon. Appropriately enough, it was the Human Torch, Chris Evans, who emerged unscathed from the fiery furnace of the Fantastic Four and Fantastic Four: Rise of the Silver Surfer. He is utterly obnoxious as Johnny Storm, but at least he leaves an impression, unlike pretty much all of the other actors in the films. He pulled a complete 180 and came across as effortlessly humble and noble as Steve Rogers in Captain America: The First Avenger. And the rest is history. His portrayal of Captain America across a half-dozen films has been perfect, joining the ranks of Christopher Reeve’s Clark Kent/Superman as the embodiment of the American Spirit and the best of what comic book movies have to offer. So Chris Evans’ character was subjected to very high temperatures, his two films were a major trial that most of his costars failed to pass, and he emerged as something new in his later Marvel films. The crucible analogy works pretty well. Then there’s Michael B. Jordan. He also played Johnny Storm/The Human Torch in the 2015 reboot of Fantastic Four. Director Josh Trank most likely hired him because he had enjoyed working with him on 2012’s superhero-ish Chronicle. Unfortunately, the latest Fantastic Four turned out to be even more of a dud than the first two, and I wouldn’t be surprised if Josh Trank, Miles Teller, Kate Mara, Jamie Bell, and Toby Kebbell never fully recover from it. But Michael B. Jordan bounced right back from that flop, starring in 2015’s hit Creed. He’s slated to star in that film’s sequel later in 2018. And appropriately, the former Human Torch is starring as a fireman who burns books in the dystopian future in a TV movie of Fahrenheit 451 this year. He is about to follow in Chris Evan’s footsteps and join the MCU in Black Panther. Again, he was brought on by a director who he’s worked with in the past. Ryan Coogler, who directed Creed and Fruitvale Station, also directed Black Panther. Just like Evans, his character was also subjected to very high temperatures, his Fantastic Four film was arguably worse than the first two and killed many people’s careers, and he is about to play a villain in his MCU debut. While not all of them are directly associated with the MCU, three other actors from Fantastic Four: Rise of the Silver Surfer have some intriguing connections to comic book movies. Laurence Fishburne provided the voice of the Silver Surfer. He joined the DC Extended Universe (DECU) as Daily Planet Editor Perry White in 2013’s Man of Steel and 2016’s Batman v Superman: Dawn of Justice. He also had a role in Passengers (2016) with two stars from Marvel franchises: Chris Pratt (Guardians of the Galaxy) and Jennifer Lawrence (X-Men). And Fishburne is about to join the MCU in 2018’s Ant-Man and the Wasp. Coincidentally, Andre Braugher (who plays a surly general) had a role in another movie entitled Passengers, which came out in 2008, and his character in that movie is named Perry. He provided the voice of the villainous Darkseid in the 2010 animated film Superman/Batman: Apocalypse. Doug Jones was the actor inside the suit of the Silver Surfer, and he has been in an astonishing number of movies, notably 2004’s Hellboy and 2008’s Hellboy II: The Golden Army. He even had a small role as a clown in Batman Returns way back in 1992. Anyway, I hope you’ve found this to be interesting. 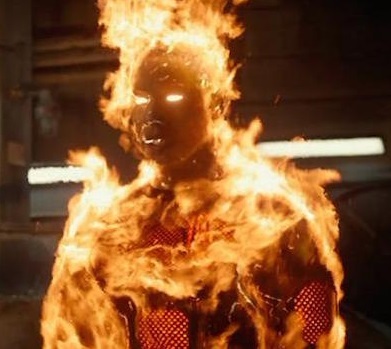 The Fantastic Four movies are the crucible of the MCU because they have a way of burning just about everyone except the one man who can light himself on fire. And the Silver Surfer and a random general. This entry was posted in Random Stuff and tagged actors, black panther, captain america, chris evans, comic books, fantastic four, films, marvel comics, mcu, michael b jordan, movies. Bookmark the permalink.